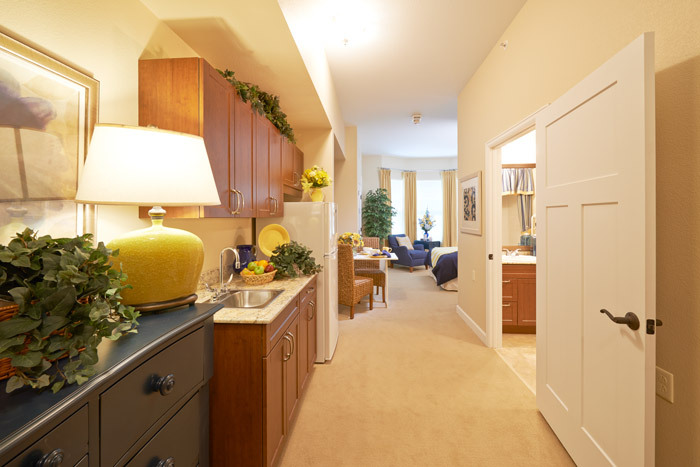 Looking for something a step above ordinary assisted living facilities in Colorado Springs? We invite you to take a look at MorningStar at Mountain Shadows…far from a “facility,” MorningStar is a true home. 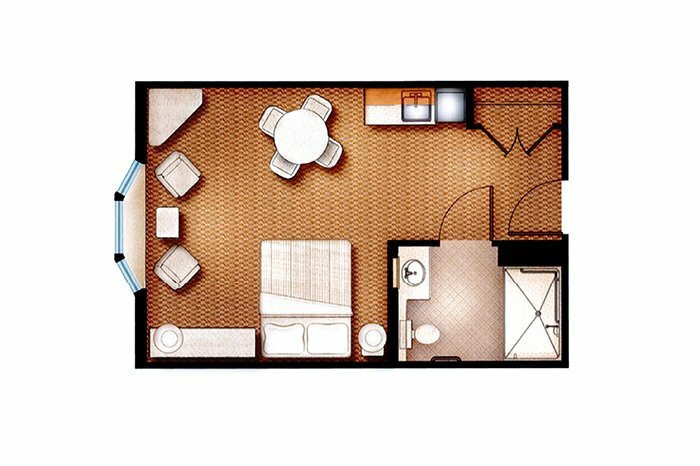 Our assisted living suites are sure to meet your needs from a choice of studio and one-bedroom floor plans to our large (up to 683 sq. 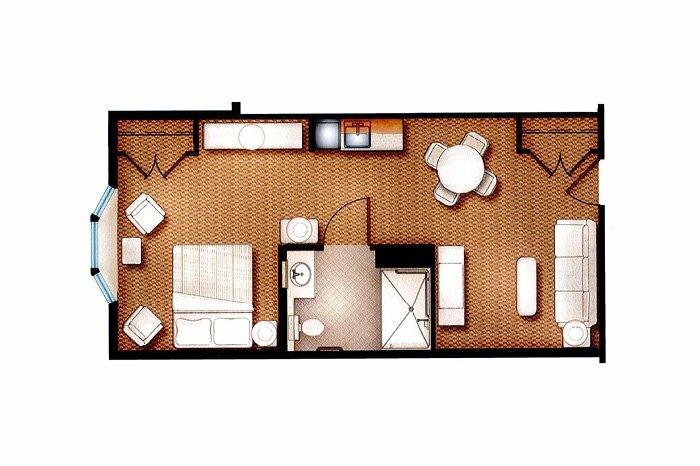 ft.) two-bedroom configurations. In our Reflections Neighborhood, we have 19 secure, memory care studios devoted to the care of those with Alzheimer’s or other forms of dementia. 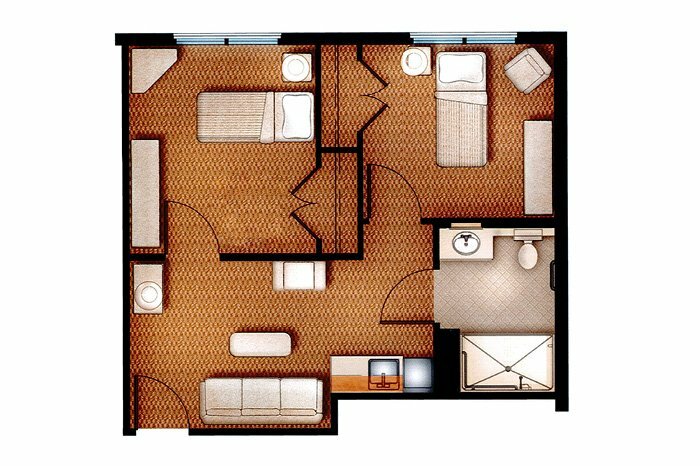 The stylish floor plans of our spacious suites are designed with lighting, high ceilings, large windows, wall-to-wall carpeting and mini blinds. 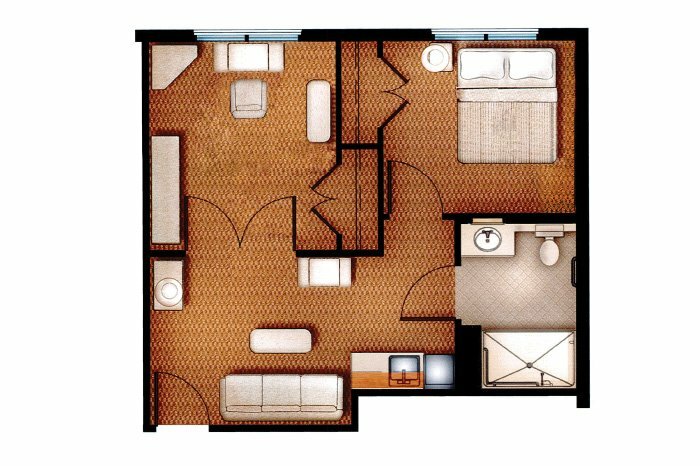 All that’s missing are your personal furnishings and treasures—even the furry kind (yes, we’re pet friendly). 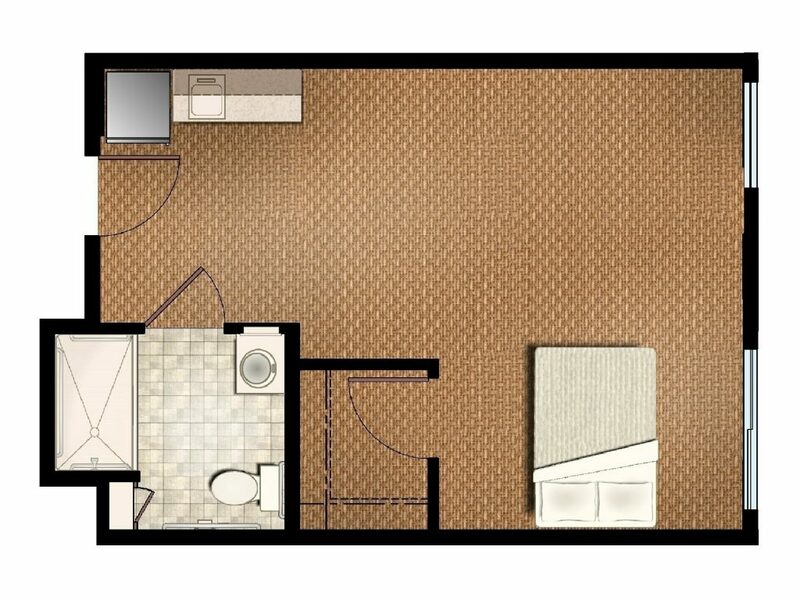 For a printable file of our floor plans, download here. When we say MorningStar is more like a resort community than the competing assisted living facilities, we are not exaggerating. 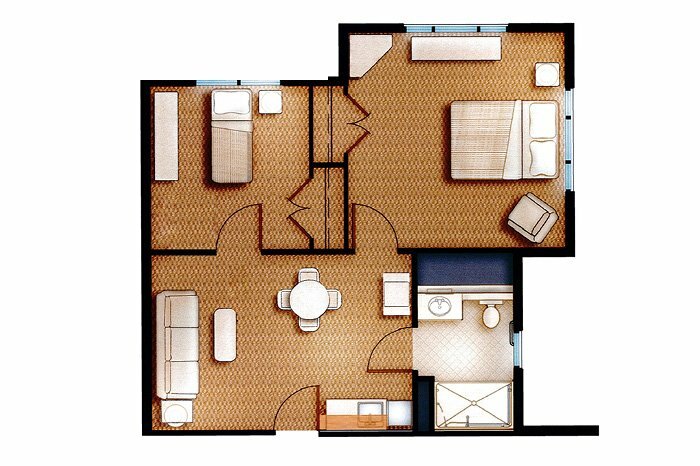 In addition to our spacious private suites, MorningStar at Mountain Shadows is filled with inviting, beautifully appointed common areas, inside and out, in which to comfortably gather and enjoy the day. We have succeeded in creating a true home, filled with comfort, community and a spirit of love. Our assisted living helps residents maintain their independence by providing various levels of assistance with daily care activities along with 24-hour care, a full-time licensed nurse, medication management and more. In our Reflections Neighborhood, our specialized team designs a personalized daily routine for each resident that is used to engage or calm as the situation demands. Services and amenities include meals prepared by our own Executive Chef, a range of wellness programs and activities, scheduled transportation, and housekeeping and laundry. Mountain Shadows also has an on-site theatre, chapel, bistro, full salon, tropical aquarium, fireside patio, strolling paths, and an elegant dining room for restaurant-style dining. In addition as our location is just north of the Garden of the Gods Road, it is convenient to area hospitals, shopping malls, banks and restaurants. To learn more why MorningStar at Mountain Shadows is not like typical assisted living facilities in Colorado Springs, CO or for that matter anywhere, schedule your tour and discover why we were recently named 2018 “Best Of” Assisted Living by SeniorAdvisor.com. Only the top 1% of senior living providers in US and Canada are designated with the award that is based on high ratings and positive reviews from residents, families and visitors to SeniorAdvisor.com. MorningStar at Mountain Shadows epitomizes the very best in senior living with a unique mission statement of “to honor, to serve, to invest.” Our foundation is built on honoring God, valuing all seniors and selecting staff with a felt calling to serve as we create a true home for residents at the foot of the majestic Rockies. We invite you to schedule a visit to discover why we are a step above ordinary assisted living facilities in Colorado Springs.